I've got several posts that I want to write. They don't run out. There is always something, even if most out there in the readership world don't think so. However, I want to do a series of posts with a critique or analysis of a book entitled, Worship Wars, by a man named Robert Bakss from Australia. What drew my attention to this book was a post written by Dave Mallinak at his blog, The Village Smithy, with the title, Gone Contemporary. Please read it. It's excellent. I haven't read Worship Wars, but I watched the podcast posted by Dave on his blog between Joshua Teis and Robert Bakss. I won't write my answer right away here, because I need to read it first, but, Lord-willing, I'm going to. When I went to find the book online, the first link was from a site called Goodreads, and there were written reviews and ratings, and I saw, positive ones. Surprising some, not entirely, but some, even from a recognizable unaffiliated. This is where we're at. What is unique here is a book by a professing independent fundamental Baptist, defending the amorality of music. He's saying amorality is scriptural. Many others are supporting this. They want it. The interview posted by Dave in my opinion is, first, inane, and second, full of one straw man after another. It is face palm inducing and nauseous. It's also very sad, sad to what these independent Baptists have become. Truthfully, they already preach a false gospel, because if you look at their doctrinal statements, they don't include biblical repentance. It's easy prayerism. Bakss talks like what he's saying is completely convincing scripturally without at all being convincing. It's hard to think he could believe himself, especially the part about Gnosticism. It sounds impressive, but it is fiction, spoken about as if there some crucial scholarship, when it is a fraud. You can't just call something Gnosticism without making connections, which they make none. Anyway, I'm going to cover Bakss's book a little at a time. I haven't read it yet, but I will. I know it's not right, just from listening to him explain. I'll also come back to "sensing" or "feeling" the presence of God, mainly in answer to comments in the comment section of that one post. I had not finished my coverage of Overmiller's attack on the preservation of scripture to justify using a modern version. I have other subjects I want to address, but these are going to keep me busy. Now I'm going to write another installment of the trip to Europe. If you want to comment on this editorial, feel free. As we were leaving our flat on Monday morning to drive to the airport, many problems presented themselves. The first was how strict the airline would be on our luggage. I had never flown to a foreign country from the United States, forget flying from one foreign country to another foreign country. It was a difficult getting out of the airport in San Francisco. It was slow upon our arrival at Heathrow. We had bought some things that were not fitting in our suitcase. This can be a mini-stressful moment, sort of a first world stress, but I decided to leave a sweatshirt that I didn't think would be necessary as we moved south. That created the space. When I left our flat, I had to find our car, which I had parked a long ways away. I'm glad I left early, because I can't believe how long it took to find it. The streets of Edinburgh are often crooked and narrow, and everything in the darkness starts looking the same. It was not a familiar car. I walked and walked, covering the same ground again and again. I stopped in front and picked them up with no parking available. We stuffed everything in and took off. We arrived about twenty minutes later to the airport. I can't tell you how relieved I was not to be driving anymore on the wrong side of the road from the wrong side of the car. We parked the car. I brought the keys to the drop off point, and we kept walking. It felt all over there, but this really was the start of it. As we entered the Edinburgh airport, we had time. It seemed safe. We had checked in. We were flying Ryanair, a budget European airline. We went through security very well. When we scanned our passports, we went right through. We went in and ate something. Then we got in line, getting close to departure, someone from the airline looked at our paperwork and said we missed something. We needed to go back through security to have our passports checked in person. It was something on signs around, but nothing that meant anything for us foreign travel rookies. I didn't foresee us making it through security, checking our luggage again. The anxiety and adrenalin were high. I led the family first into a shop and asked somebody in the shop to watch our luggage. That was a big, no. Wouldn't, couldn't do it. We had a friendly conversation at the restaurant with a Scottish couple. We begged them with fear in our eyes to watch our luggage, while we went through security again. They were very sympathetic and did it. They were a life saver. A young Filipino woman was moving with us every step of that way, because she had done the very same thing we did, so she just followed us. We exited, were shown the way to security. People were helpful. We were running. The plane was already being boarded. It is a pathetic, weak looking run. Our passports were checked easily. We got through security very very fast, because it was still early. Our flight was to leave at 6am. We didn't have luggage. We met the Scottish family, got our luggage from them, thanked them profusely. The Filipino young nurse was very happy with us, because we led her to success. We were sitting on the front row of the plane. That was nice. You should always thank the Lord, because these things are part of His providence. We did. Our flight was from Edinburgh to Bologna. 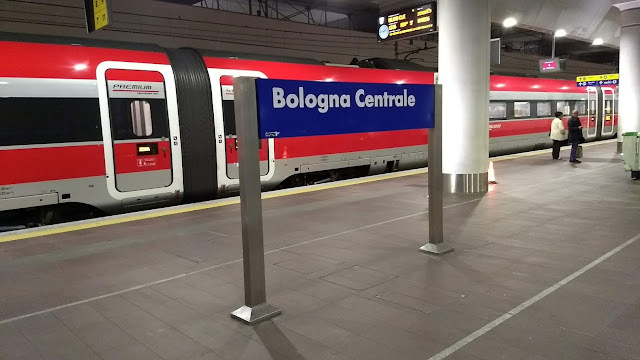 We were traveling to Venice, but we flew to Bologna, because overall it was less expensive to go from Edinburgh to Bologna by plane and then from Bologna to Venice by train, then to go the straight shot to Venice. It was more adventurous anyway, because we got to include a look at Bologna briefly. The flight went fast and we were in Bologna. This was going to be the new experience of a new language on this trip. I didn't know how much of an effect that would have. I had heard that Europeans knew English, so I wondered. Italian security was easy. The border guards didn't even look at us as we showed ours. They just stamped them. We got right through. This seemed like a common sense situation that isn't felt in the United States, It made me happy. Airport security sent us right through because we did not look like a threat. We made our way to public transportation, which was a bus, actually more expensive than I expected, almost the cost of the train ride to Venice, to travel to the Bologna main train station. We got there and then it was a matter of finding our train. We found out the track number from someone in the middle of the station who knew English. In a place like Bologna, Italians don't know English. You can't talk to almost anyone. You need someone helpful in the train station, and you can find it, but you have to look for it. After knowing the basic information and knowing right where we needed to be at about 1pm or so, we went close by to get food in an air conditioned location, where we could wait. Bologna looks like a third world country, just saying. It doesn't feel dangerous, but it doesn't feel that safe either. It's dirty, compared to what I would like. I have to say that lots of places in the United States are just as dirty or dirtier and have less a feeling of safety, including where I live in California. We have far worse crime. Once you get past the initial look, Italy seems safe. The worse of it are pickpockets and we knew that, but there isn't the feeling of violence, especially in Northern Italy. At the little restaurant, something you might see near public transportation, we got Italian food. 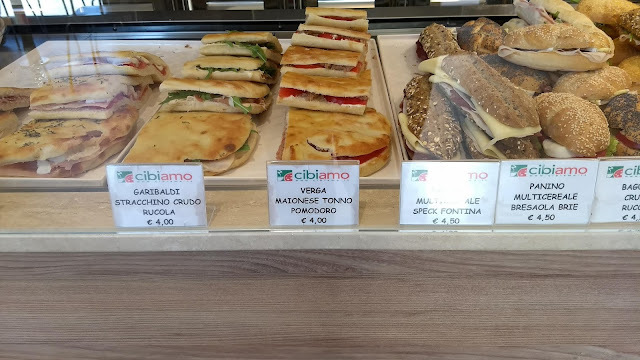 Every Italian food in Italy is Italian. No risk there. Some is going to be better than other. It was cheap Italian food, but we liked it because it was our first in Italy. It was hot there in June, not like Arizona, but quite a difference from just being in Edinburgh. The jackets and sweatshirts and sweaters were gone. We were to our train in time, right place, right seat, and very comfortable and very fast from Bologna to Venice. We made it to Venice in no time. The place we were staying in Venice was very close to the Mestre train station just north of Venice. We had planned on going there first. We were tired. We could walk to our place and we did. This was the most fantastic place we stayed our entire time on the trip. The owner's name was Massimmo and he himself was a world traveler, who seemed to know every language in existence. We spent time talking to him about Venice and Europe. He was a Venice native and considered Venice to be its own region in Italy, very different than the South. He understood what was happening in the United States very well. We rested, and if there was anything about this point in our trip, we stayed too long before we got on the train into Venice. I'll bring that to you in the next post.